The Sandbox crew! We also have another lovely full time staff member, Debbie, not pictured here. Updated staff photos in the works! Our goal is always to have someone greet you within the first few minutes of coming into the store. As we have a fairly large store, it can be tricky to keep track of who has spoken to who, so sometimes you may be greeted by more than one person. If you happen to turn a certain way upon entering and get blocked by a rack or pillar, we may miss you until you get further into the store. This is never intentional — we always want you to feel welcome! We work one-on-one with our customers at the dressing rooms, so if you aren’t greeted right away, please know we aren’t ignoring you, just helping someone else at that moment. If we happen to miss you upon your entering, please just approach one of us for help and we will set you up with one of our staff as soon as possible! Sometimes you may not want assistance right away when first greeted, but after browsing for a while, are ready for some help. At this point, just ask! Along with helping customers, we work on various tasks throughout the day, from pricing and unpacking stock to merchandising, cleaning, filing, reordering, and creating The Sandbox social media content. We may appear busy, but are ALWAYS ready to help. We don’t continually “check in” with every customer that is browsing (we know you need time to just look!) so just let one of us know as soon as you need assistance. Staff cell phones are not allowed on the floor during the work day, so know that if you see someone working on an iPad or computer, it is all work related — feel free to interrupt! We also want you to know that we take in as much as we can in the first few seconds when we greet you. Dressing people is what we do for a living, so the more information we can gather visually, the easier it is for us to choose things for you if you require our help. We are never judging anyone for what they’re wearing (many of our customers pop into the store straight from the gym), but sometimes it is helpful to get a feel for your taste by observing what your style choices are. Hairstyle and color, and even eyeglass style, can give us a bit of a window into your style, so we notice that too! 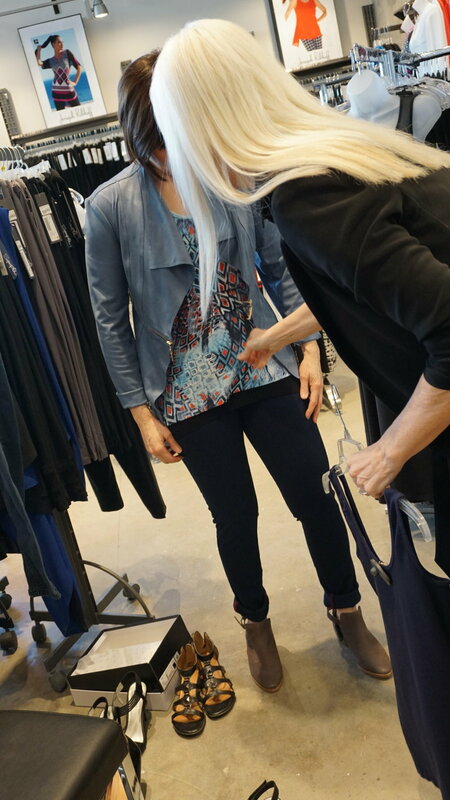 Juanita usually goes shopping in a ball cap, leggings, and a hoodie, so we can assure you there is never judgement on what you choose to wear shopping — we are simply here to help you find what you need! New customers to the Sandbox can at times be a little overwhelmed when they walk through our doors. We have a lot of inventory! When we (Colleen and Juanita) go shopping for The Sandbox at the buying shows, we do not have a set budget for each season. Therefore some seasons you will find slightly less stock or slightly more stock, depending on the quality and selection of what is being shown. We don't simply choose items for our own body type or what our personal style is, we buy for women of all ages, shapes, sizes, and styles. So while we have a lot of merchandise to browse through, every single item has been chosen with a great deal of thought and care. We also try on every single sample before it makes it onto our order form. We are each other's mirror and within seconds an item is deemed a yes or no. We check EVERYTHING, from length, fabric, stretch, pattern placement, color, collar style, neckline, and more. Then we choose sizes and colours that each garment is offered in. (Some have eight or more colour options.) We are most interested in how the garment feels as well as how it looks, so if it is itchy or binds in anyway, it is GONE. The best part of getting a sneak peak (and feel) of all of these items, is that once they hit our floor, we already know they are amazing and how they fit, plus what body type they are best suited for. It is truly a science! Our store is laid out like this: Display and mannequins in front, (left and right) as you walk in. These are changed regularly with many different styles and themes. We do this so that people get a feel for what we carry in the store in a quick and eye catching way. If you turn to the left you enter our dressier section, highlighted by Joseph Ribkoff, Frank Lyman, Michael Kors etc. In the center of the store we house our Sympli line. We chose this location because it’s close to the dressing rooms, so easier for us to find and "see" (lots of black basics), plus easier for our customers to navigate, as it is not mixed with any other brands. On the middle left wall we have our dressing rooms. We put them here for good reason! The main one is so that we can physically see who is going in or coming out from many vantage points in the store, making it easier for staff to assist customers. It also builds camaraderie between staff members as well as with customers. Trust and confidence are gained when women can hear and see each other dealing with real life issues and body struggles, as well as getting feedback from more that one staff member if necessary. We all try to help each other achieve our ultimate goal, which is to find what our customers want and need (sometimes when they aren't even sure what that is). On the middle right side we have our sorting area and cash desk. This enables staff to monitor the activity of the store fairly well, especially with our video monitoring system which is right up front too. (The red arrow is pointing to Juanita waving from the floor!) And that's our Yoda with his Saskatchewan Roughriders jet -- he's been with us for 10 years now. "Do or do not. There is no try." And that is Part 1 of Sandboxing 101! We hope this helps give a greater understanding of the business, our current space, and all the thought behind it. Every retail store has its own unique way of doing things, and it’s fun to share our approach with all of you! Stay tuned for our next installment of this series in the coming weeks. We have lots of great info on the way. Until then...pop in to see us soon!